The philosophy of Foresight is to deliver the absolute newest versions of all software possible, this often means beta or even alpha releases and so it’s definitely a distro on the edge in my opinion. It tracks Gnome development very closely which interests me particularly, as regular readers will know I love Gnome. It also features the Conary package manager from rPath Linux which has been getting quite a bit of hype lately. I didn’t know much about Conary going into this, certainly not the workings of it anyway, so I was eager to find out more. I downloaded the install DVD for Foresight 1.4.2 and fired it up to be greeted by a variation of the well known Anaconda installer from Red Hat. I know a few people who have problems with Anaconda but it’s always worked flawlessly for me on my systems, it’s usually very efficient and it’s certainly well developed with the might of Red Hat behind it. I was then shown a splash screen of the Foresight logo along with the words “because your desktop should be freaking cool” which made me chuckle a little. A refreshingly non-corporate tag line I thought in these days of nauseating management speak. I went through all the usual steps to install the system, selecting locale, time zone, partitioning and root password. I partitioned my 200gb disk as I normally would using Disk Druid, setting a root partition of 12gb, swap of 3.5gb and the rest as /home. This worked fine and I was able to do it pretty quickly. I was then left twiddling my thumbs while the system installed. I expected the install to take about 10-20mins, as most distros do but I found this took a lot longer, a hell of a lot longer. I waited half an hour and it was still nowhere near finished, I got to a stage where the screen read “running post installation scripts” which I watched patiently for 15 – 20 mins before deciding the installer must have crashed and aborting. I started the whole process again with the same results but this time I decided to just leave it and see what happened. Eventually after over 1hr 20mins I reached a screen which said “installation complete”, horray I was begining to lose the will to live. I’m not sure why the install was so slow and I tried it a couple more times (yes really) to confirm this wasn’t just a fluke. I can only assume the system was downloading a lot of updated software packages from a particularly slow mirror and that caused the delay. Either way it certainly wasn’t a quick install. I booted up the system to find a pretty standard Gnome desktop, the screen resolution was set at 1280×1024 and I assumed I’d have to install the Nvidia drivers for my graphics card to fix this. I found an Add/Remove Software tool under the System / Administration menu of Gnome so I decided to fire it up and see what I could find. This is a GUI front end to the Conary packaging system and it feels a little like a very cut down version of Synaptic, I hear it’s still in development. I searched for Nvidia but didn’t really find anything of use so it was quickly onto Google to search for help. This led me to a guide on the Foresight Wiki for installing Nvidia/ATi drivers with Conary. I copied the commands pretty blindly into a terminal which is not something I normally like to do but I could see from the commands they were similar to the kind of thing you’d use with Apt-Get under Debian. Using this guide I added the appropriate repository to Conary and installed the Nvidia binary drivers. 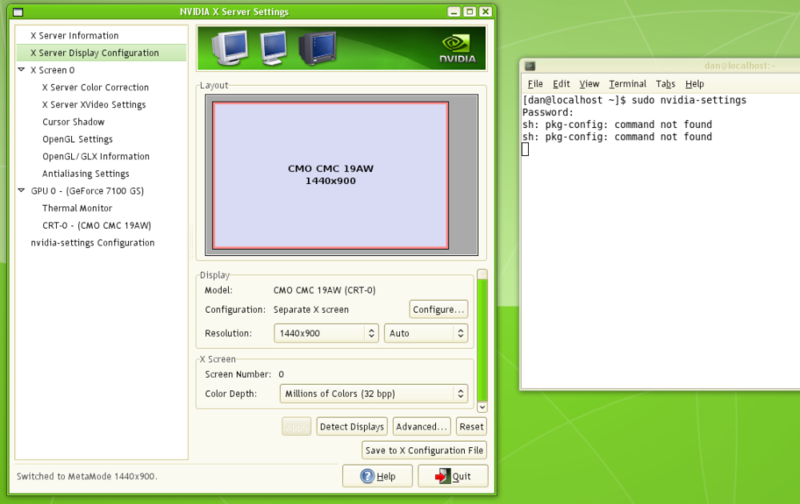 I then ran the “nvidia-settings” command as root to fix the screen resolution to 1440×900, I’ve done this in many of my previous reviews so if you’d like full details take a look at my Vector Linux article. I found after restarting the X server that desktop effects were automatically turned on and the GLdesktop applet appeared in my system tray. I had wobbly windows, 3D cube and all the usual stuff working fine. I then realized that the keyboard layout and input language was set to US English even though I’d selected UK at install and I had to fix this in the admin settings. I also had to set Firefox as the default web browser, the default as standard is Epiphany in Foresight and it’s not a favourite of mine but it wasn’t hard to change. 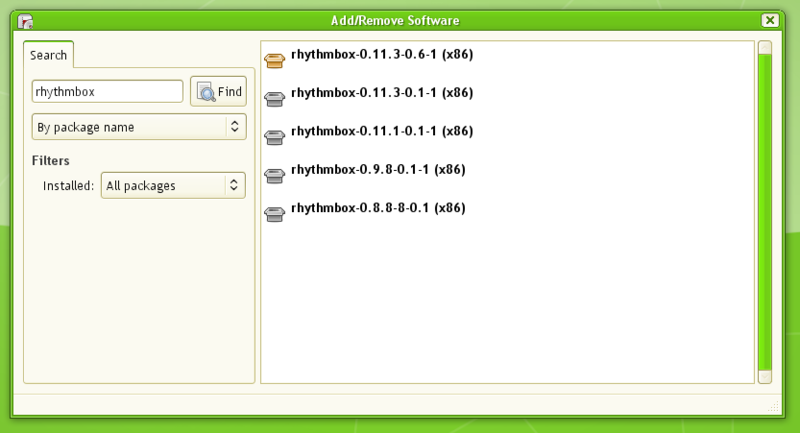 I then moved on to look at the software installed by default and see what I needed to add. 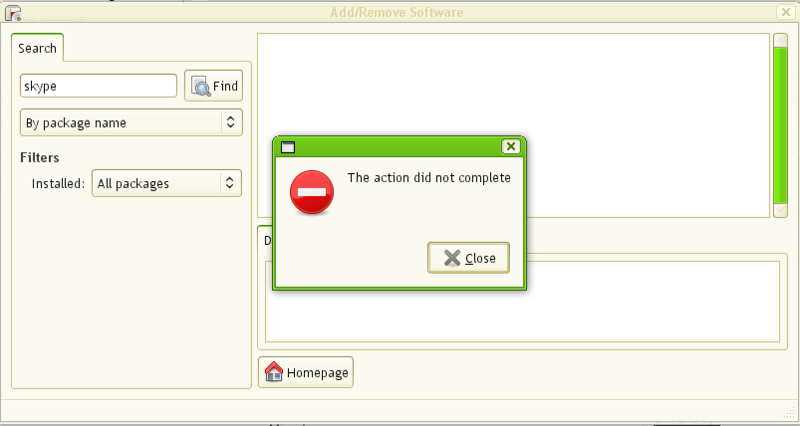 I found all the usual stuff you would expect from a modern Linux distro: Firefox, OpenOffice, Pidgin, GIMP etc etc. I was also pleased to see Brasero installed as the default disc burning tool, I find it the best Gnome tool for this by far. K3B is great under KDE but Brasero rocks on Gnome for me. I then moved on to installing some of my favorite apps with the GUI to Conary again, I found that there was no browse feature and you had to search for everything manually. Not a major problem but it did seem a little strange coming from a Synaptic background. The repos seemed pretty deep and I was impressed by the amount of software on offer but the download servers seemed painfully slow, again shedding some light on the slow distro install I think. Foresight is a small distro without a wealth of server farms and so on, so this can be understood but retrieving packages took a long time. I installed Bluefish, Rhythmbox, VLC, Inkscape and a few other things very easily. It’s just a case of searching for and then selecting the packages you want, very simple… provided what you want is in the repo obviously. 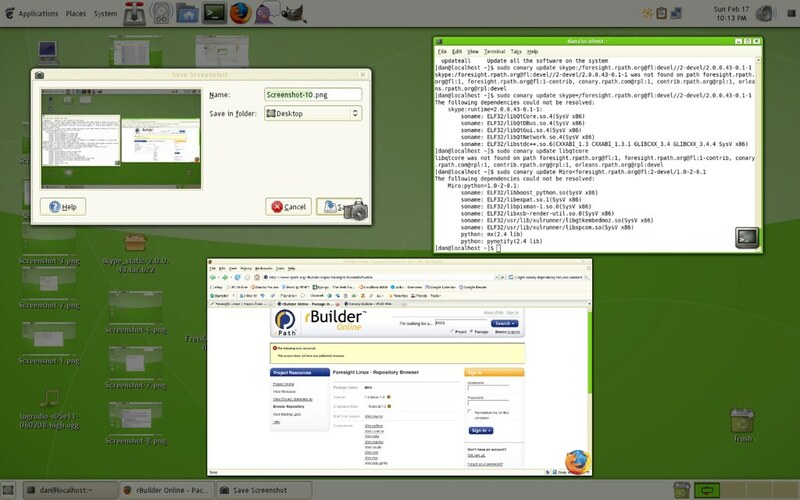 I found that there were a few extra things I still couldn’t find and this is where the rBuilder website came in, it’s an online repo for rPath packages which you can search and install from pretty easily by copying the details into a terminal and using Conary like you would Apt-Get. It wasn’t immediately obvious how to use it but I worked things out by reading some of the documentation, which I must say is very clear and well written. 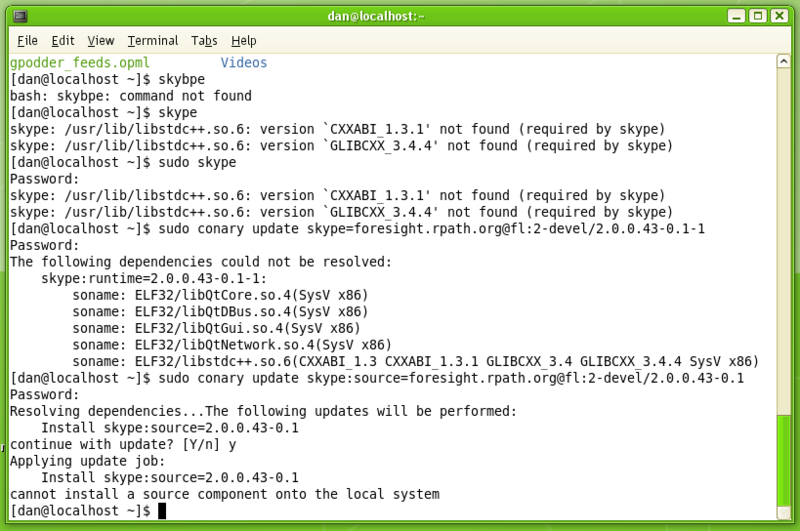 I couldn’t seem to get Skype installed even though I found a package on rBuilder. I kept getting install errors with all the versions I tried and dependancy problems. Not a great experience, I then found installing pretty much anything with Conary became impossible. It seems my local database had become corupted or unwritable. I tried to install Skype using the static builds from the Skype website but these wouldn’t run due to unsatisfied dependancies. I spent a few hours trying different things and wrestlling with it but in the end I gave up and decided not to bother. I’m sure it could be done of course and my level of ineptitude does not necesserily reflect the experence you will have but prepare to be patient. Multimedia seemed to be very well suported out of the box in Foresight, it uses Gstreamer as the main processing engine and it was happy to play Divx, Xvid and WMV videos for me without any trouble. Along with mp3 and other audio formats, this all worked with Totem, the default player. Banshee is the default music manager included and it’s not a favourite of mine, I found the Last.fm scrobbling was erratic and I just don’t like the general layout of your music so I switched to Rhytmbox and all was well. All the Firefox plugins you could need were also installed out of the box, Flash, Java and my favorite browser video handler Mplayer-plugin. All in all using Foresight as an everyday desktop was pretty simple and not too daunting but there were a lot of stability issues on my system which I will come to next. So we come to the Conary package manager, a major feature of Foresight. The idea behind Conary according to the guys at rPath is to marry version control and package management into one. To achieve this Conary uses a relational database to keep track of installed packages on the local system, it then compares that to a remote database to manage updates and so on. It allows you to roll back your installs multiple times and can be very flexible in this regard. This seems like a great idea and it’s very innovative but I found some major stability issues with it. After the initial install I found that updates no longer worked, I kept getting a message on the desktop each time I logged in, you can see it to the right. So after spending a good week or so with Foresight I felt that it was very much on the experimental end of the distro spectrum. It is consciously cutting edge and that’s an aim of the project so don’t be surprised. It succeeds well in delivering the latest software and if you are happy to brave some of the stability problems there’s a lot to be had from this distro. I’ve enjoyed using it but I don’t think I could run this day to day as my main desktop, I’m not afraid of living on the edge but when I need to get something done urgently I need to know my desktop isn’t going to crash and burn on me at an inconvenient moment. I think Conary has a lot of potential as a package manager but I found it a little confusing to use at first. It can build software from source, manage multiple development branches and merge changes, all at a very granular level. That’s why it’s described as version control mixed with package management. For developers I can see how much of a major benefit this would be but on the average home desktop I’m not sure how relevant it is. I suspect it’s probably aimed at the business user or someone who manages a large number of projects and desktops. I have heard that some of the problems I experienced are to do with the particular implementation of Conary in this version of Foresight. I noticed that Foresight 2.0 is in beta now so it will be interesting to come back and give that a try once it’s out. good review, it seems that everything you said you like in foresight is done in arch. in every aspect of it. but the files are amazingly well orgainzed very well commented. its just need to be seen to be understood. so feel free to use it. Wow, that’s a GREEN theme… Great review. I’ll have to check into that package manager. Great review, Dan. I look forward to the review of the XPS m1330 – that is one beautiful laptop, and (if I had any money to spare) I’d be very interested in getting one if it works well. It’ll probably be next week now before I do anything with Arch though as I have to rearrange all my systems and reinstall/rebuild a few things, not that the laptop is my main system I can upgrade my music studio with the old desktop which is the one I’ve been testing these distros on and then build myself a dedicated test machine out of the parts I hope. That’s the plan anyway. It’ll take a few weeks to sort it all out. Oh yea, if you happen to read the install guide, you’ll do fine, just follow/understand why it’s giving you those instructions and you’ll be an arch convert 😉 Arch was my 1st distro actually lol, and since then I use Debian sid and FreeBSD as it has given me the knowledge base for all other Linux based enjoyment. No need to really fear the installation as a gruesome task as slack, but there are reasons to following the guide, once you go through it 1ce or twice you won’t need it anymore anyway. Not like the Gentoo install manual…. And what you’ve herd about pacman has earned its right to fame, its as simple as apt-get and less typing too “pacman -Syu” instead of “apt-get dist-upgrade” which both the commands are similar and recommendable to do often in arch. One LAST crucial bit, watch as you upgrade, I haven’t used arch for maybe 1/2 a year now but its what set out the successful archers to the unsuccessful ones. That advise is to watch the upgrade as it happens, and to follow any upgrade instructions that come with the package and are displayed as pacman is updating. Great review again Dan. I too have had Foresight on my “to do” list for some time now. You just put that one to bed for me, so thanks! Its funny, but having tried the distro jump dance for the last 1+ year myself, I always end up back on Ubuntu. I am really looking forward to seeing what is going to happen with the future of Sabayon Linux, now that Mr. Robbins seems to have possibly joined that team, and conversely, Gentoo, now that they have pushed him away. I’m sorry to hear you had a bad experience with foresight, but I suggest you wait for 2.0 to stabilise, it really is leapyears ahead. -You can’t install software with conary as a regular use. Try with ‘sudo’. I really can’t agree with your scoring. Your bad experience does not to justice to what is otherwise a rather brilliant distribution. To say that I’m still using the alpha version at work and having no issues must say something about the stability surely? On top of that, I don’t feel you give the community credit. If something isn’t covered in the documentation, pop onto irc, ask a question and I’m sure someone will help you out. Regarding arch, well it’s not aimed at the same type of person as foresight. It’s a good distro for the sort of person it suits, but it really isn’t comparable to foresight. I’m really not going to go into the bitter rant that sabayon (or indeed drobbins) deserves. Anyway, give Foresight another shot when the alpha stabilises. To say that I’m still using the alpha version at work and having no issues must say something about the stability surely? @James Laver – Thank you for you comments and I take your points on board. I can’t agree that Foresight is stable I’m afraid, not this release on my hardware, no way. I tried to make the point that I was only referring to this release on my particular hardware and not the distro as a whole, I said that numerous times, I’m sorry if that wasn’t clear enough for you. I also said I would like to see what happens with Foresight 2.0 and I always take each release on it’s own merit. I also avoid comparing distributions directly unless they specifically compete for the same user or market, base such as DSL and Puppy. Therefore I will not be comparing Arch to Foresight, I know they’re different. I will be back to look at 2.0 when it’s released don’t worry. FYI – There is one acknowledged bug in the Arch installer. Sometimes, the permissions on the /tmp directory don’t get set properly. If you find that you can’t log into your desktop manager, ‘chmod 1777 /tmp’ should fix the problem. Don’t let that scare you off, though. Arch is a wonderful distro that deserves more exposure. Thanks for the warning Lee, I’ll take note of that. Haven’t started with Arch yet as most of my PC hardware is still in piles on the floor. I’m waiting for the drive trays to be delivered.